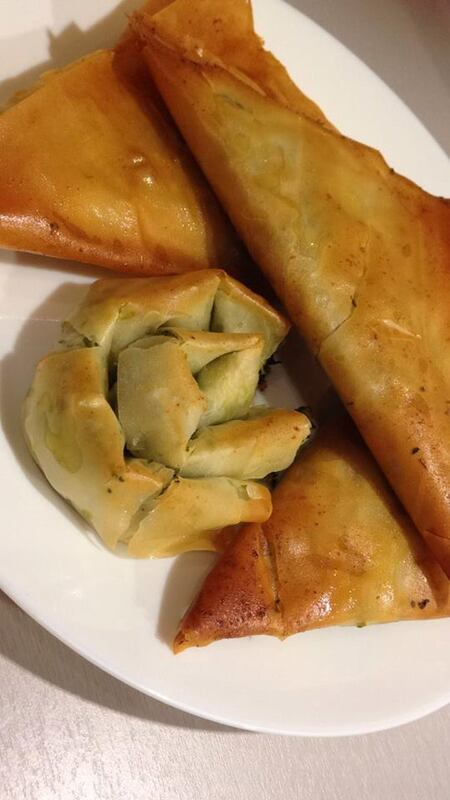 Here's a nice recipe to use up that random filo pastry you bought. I love Greek food and have found myself missing it as of late. So, I thought what better weekend lunch to prepare than a Greek Spanakopita (Greek for spinach pie). It's simple and quick to make, tastes delish, and reminds you of a sunny Greek beach in the midst of a chilly winter; what's not to love? This recipe only makes three triangle pies but if you want to make more, just increase the quantities and use more pastry sheets. 1) Preheat the oven to 180°C/350 F/ Gas 4 and line a baking tray with baking paper. 2) Put the spinach in a sieve over a small mixing bowl. Using the back of a spoon, push the spinach slightly against the mesh of the sieve to squeeze the water out. Blot the spinach with kitchen paper to get rid of any water still hiding on the surface. Once you’re sure all the water has been squeezed out of the spinach, tip it out into a separate bowl. 3) Heat the olive oil in a frying pan and add the garlic. Fry for 1-2 minutes on a medium heat until golden. Add the garlic to the spinach along with the feta cheese. Rub the mixture together with your fingers, crushing the feta cheese cubes into the spinach. 4) Place 1 sheet of filo pastry on the work surface with the longest edge facing you. Brush with butter and place the other sheet on top, brushing this one with butter too. With a sharp knife, cut the buttered pastry vertically into three equal sections. 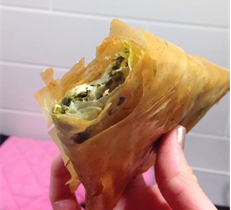 5) Place 1-2 tablespoons of the spinach and feta filling onto the top left corner of one of the sections and fold the pastry over to meet the other side, making a triangular shape. Continue to fold the triangle down the length of the pastry until you reach the end. Cut off any excess pastry and pat down the edges to close any big gaps. Repeat with the other two sections. 6) Place the triangles on the baking tray and brush generously with butter. Bake on the middle shelf for 20-25 minutes until golden brown. Allow to cool a little bit before enjoying 😊. · If you have any pastry and filling leftover, you could try doing a spiral-shaped pie: Layer 2 pieces of filo pastry on top of each other, using melted butter to stick them together. Cut a square out of the pastry and brush the top layer with more butter. Dot some spinach and feta filling along one edge and spread it down the length with your fingers so there’s no gaps. Tightly fold the pastry over the filling and continue to roll it up to the other end into a sausage shape. Brush this with more melted butter and, starting from the end closest to you, roll the sausage up into a spiral. Bake for 20-25 minutes until golden. As you can see from my photo, filo pastry tends to crack very easily when you roll it up in this way, so if you are going to choose this shape, you should work quickly and aim not to leave the filo pastry sitting on the side too long (exposure to air makes the pastry go dry). Have you ever baked something that came out of the oven perfect and tasted divine, to then lose the recipe and never be able to bake it again? Yeah. That’s what happened to me with this fruity tea loaf. I can’t remember where I found this recipe on the internet but whoever originally posted this, I thank you from the bottom of my heart because it is the best tea loaf I have ever had the pleasure to bake and eat. Luckily, I found the recipe recently on a scrappy piece of paper hidden among a collection of random stuff in our kitchen. There was no title on the page, just a simple list of ingredients and vague instructions. The best kind of kitchen mystery! 1) Preheat the oven to 150°C/ 300 F/ Gas Mark 2. Line a 9 x 5 inch loaf tin with baking paper or a made to fit paper case. 2) Heat the black tea, sultanas, sugar and butter in a large saucepan. Bring this mixture to the boil and simmer for 10 minutes, stirring regularly. Take off the heat and allow to cool for a few minutes. 3) Meanwhile, sift the flour, bicarbonate of soda and mixed spice into a wide mixing bowl. Make a well in the middle of the dry ingredients and pour in the wet mixture. Throw in the beaten eggs and quickly stir everything together to avoid the heat of the liquid cooking the eggs. 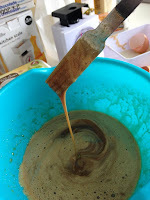 4) Once everything is well combined spoon the cake mixture into the loaf tin and even the top with the back of a spoon. Place on the middle shelf in the oven for 1 hour 30-50 minutes. After 1 hour place foil over the top of the cake to prevent it burning. At the 1 hour 30 minutes mark, test the cake with a knife or skewer. If the skewer comes out clean the cake is baked, however if some batter remains on the skewer leave the cake in a bit longer. Once baked, allow the cake to cool in the loaf tin. 5) Slice into generous slices and serve with a nice cup of tea. This loaf cake is nice with a spreading of butter. Today marked a special occasion: the day I went back to baking for the first time in… well a long time for me. I’ve been so busy with my Master’s degree that, unfortunately, baking has fallen to the wayside. But today I finished an assignment and didn’t quite fancy going back to my other studying so I thought today was the day that I got cracking the eggs into my mixing bowl again. So, what did I bake I hear you say? Well I’ve had a madeleine tray in the cupboard for a long time so I thought I’d dust that off! 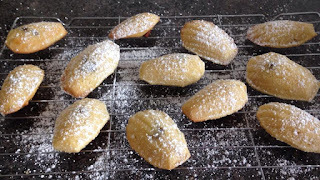 Being as it was actually my first time making madeleines, I used Michel Roux Jr’s recipe, however replaced his preferred lemon flavour with vanilla and chocolate chips. Oh and another thing… just as I was melting my butter I found out (much to my Angel delight) that the battery on the scales was completely gone. I was forced to guestimate with tablespoons instead. Luckily everything turned out smoothly (or springy to the touch and light as you will soon find out). 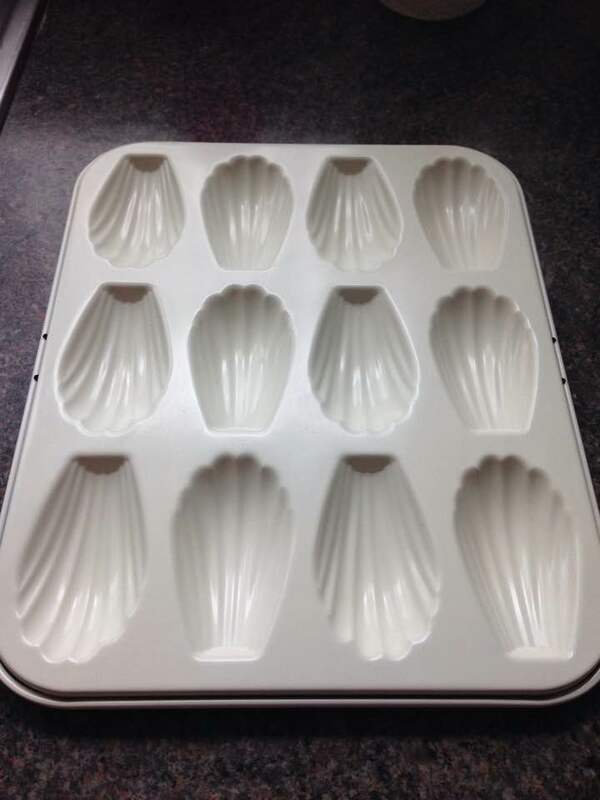 Before you go any further, make sure you have a madeleine tray! -1 tablespoon extra melted butter and plain flour for dusting the madeleine tray. 1) Melt the extra tablespoon of butter and brush around a madeleine tray with a pastry brush. Sieve a couple of tablespoons of flour over the madeleine tray and tap off any excess. 2) Preheat the oven to Gas 6/ 200°C/ 400F. Whisk the eggs and caster sugar together in a mixing bowl until frothy and slightly thickened. Sieve in the flour and baking powder, and add the vanilla extract and melted butter. Fold everything together gently with a spatula and leave to rest for 20 minutes. 3) Stir through the batter once more and carefully fill the holes in the madeleine tray. Sprinkle a few chocolate chips over the top of each madeleine and push in slightly with your finger. Bake the madeleines on the middle shelf of the oven for 8-10 minutes until risen and springy to the touch. 5) Once cooled, dust the these cute little French cakes with a dash of icing sugar and enjoy with a cup of tea or coffee. I went on a shopping trip the other day and of course what happens when you go and randomly browse the shops? Yes, you come back with something completely random. And that’s exactly what happened to me. I went shopping with my best friend and we made the mistake of going in the cookware shop in town which had a few discount baskets…and the next thing I knew I’d left the shop with a cookie stamp, with which you can stamp your very own messages onto your bakes. Before I picked this little gem up I didn’t need anything but once it was in my hand I just couldn’t imagine my baking cupboard without it. So of course I had to make some biscuits to test it out. I used the basic biscuit dough recipe on the BBC website (find it here), but tweaked it a little, halving the butter and sugar, adding a tad more flour but keeping the same amount of egg. The basic biscuit dough on the BBC website is just a canvas, upon which you can add whatever flavours you want. I chose lemon and white chocolate. 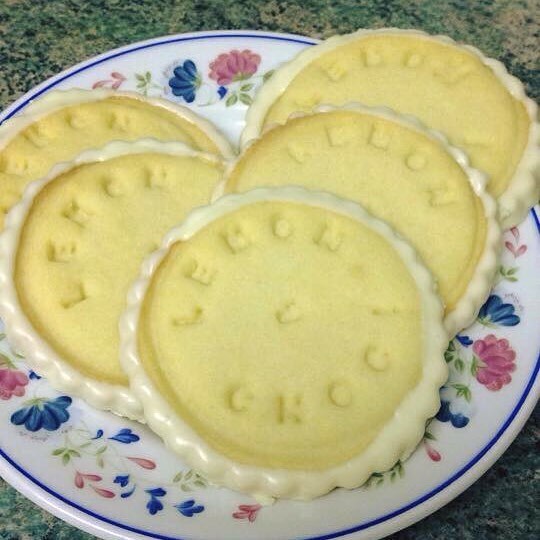 These biscuits are perfect for a light afternoon treat with your cuppa. 1) Grease and line a baking tray with grease-proof paper. Preheat the oven to 170°C/Gas 4. Cream the butter, sugar and lemon zest together until light and fluffy. Mix in the egg yolk and then gradually sieve in the flour, mixing after each addition. When the dough gets stiffer to stir, get in there with your hands and gently knead the rest of the flour in. The dough will be softer than a normal biscuit dough but still mouldable. Wrap the dough in cling-film and refrigerate for 20-30 minutes. 2) Take half of the dough and roll out to the thickness of a £1 coin. Cut out 3-4 inch rounds with a fluted cookie cutter (I find the crimped edges these cutters create, hold the melted chocolate a lot more). 3) If you have a cookie stamp, now would be the time to use it! Once you’re happy with the design of your biscuits place them on the baking tray, leaving a few centimetres between each one. Bake for 13-16 minutes until the edges are brown but the tops are only a tiny bit golden. Leave to cool on a wire rack. You’ll find you need to do about 3 batches of baking. 4) Place a sheet of grease-proof paper on a couple of trays. Melt the white chocolate in the microwave or in a bowl over a pan of simmering water. Allow to cool a little bit. Take a biscuit and twirl it so that only the edges get covered in chocolate and then place on the tray to set. To speed up the setting process, put the biscuits in the fridge for half an hour. 5) Boil the kettle, get the tea or coffee out and enjoy. Salted Caramel Brownies – Belgian style! In the past I have had a love-hate relationship with brownies. Love, in the sense that I loooooovveee eating them. Hate, in the sense that any brownie mixtures I tend to make HATE me and the resulting brownie is always too much on the underbaked side. However, I ran into this little recipe by Asda Good Living, claiming to be the ‘ultimate’ recipe so, naturally, I just had to give it a go. This recipe informs bakers to plunge their tray of fresh from the oven brownies into a tray of cold water to start rapidly cooling them. This sounded a bit extreme but once I tried it I never went back. I’m not sure on the science aspect of this but, in my head, it would make the sugar crystals seize up a lot quicker, hence helping the brownie set. Whatever the scientific reason, it works and that's all I need to know. As well as chocolate brownies, I wanted to do something with this product.......Lotus Biscoff spread! If you haven't heard of this stuff you should educate yourself. You know those caramelly little biscuits you get with your coffee in a cafe? Well..lesson 1: that is called a Speculoo and it comes from Belgium. 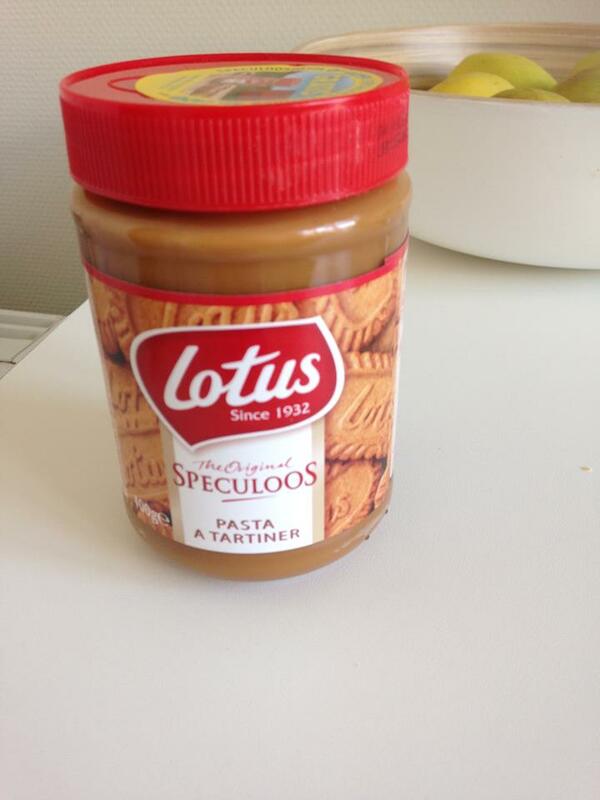 Lesson 2: there's a spreadable version. And whilst in Belgium, I thought it only right to do something with this little beauty. 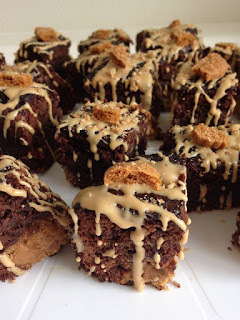 So I went on the Lotus Biscoff website and found this recipe, which involves creating lotus balls of goodness (go with me on this one) and submerging them in the luscious brownie mixture. I was sceptical at first too. 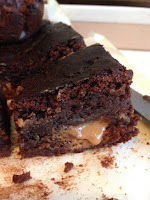 So I combined the 'ultimate' brownie recipe I adopted recently with the above 'lotus balls' recipe, made a few tweeks of my own and hey presto, I give you my own version...with the added twist of the salted caramel flavour rather than just plain Jane. 1) First, make the Lotus Biscoff spread spheres: In a small bowl, mix the lotus spread with enough of the icing sugar to create a pliable dough, similar to fondant icing. Divide the mixture into conker-sized spheres. Place on a plate and sprinkle with the salt. 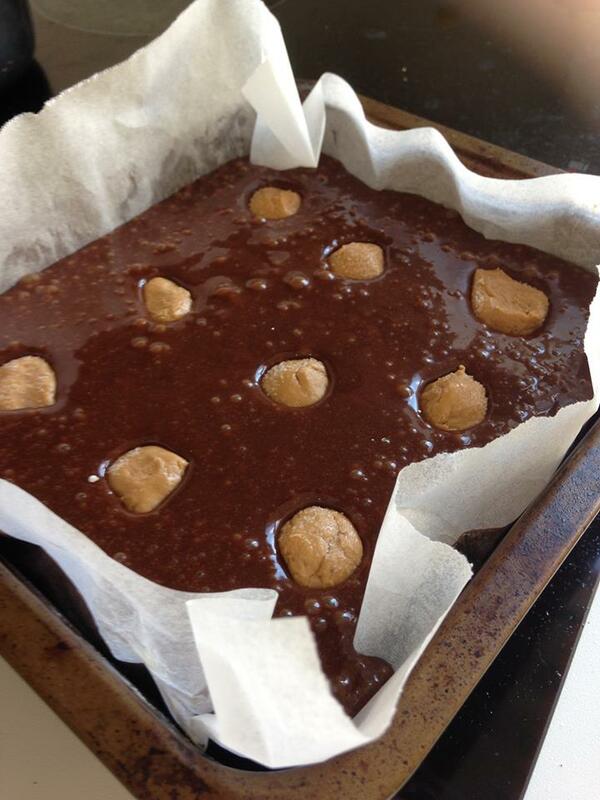 2)Make the brownie mixture: Preheat the oven to 180°C/Gas 4 and line a square tin with baking paper. 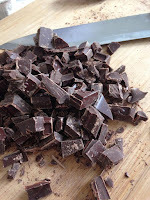 Chop the chocolate and, along with the butter, place in a heatproof bowl set over a pan of just simmering water. Do not allow the water to touch the bottom of the bowl. egg yolk for a few minutes until thickened and frothy. Add the sugar and whisk to combine. 4) Once melted together, pour the chocolate and butter mixture into the eggs and sugar and gently fold through. 5) Carefully fold through the flour, baking powder and salt. 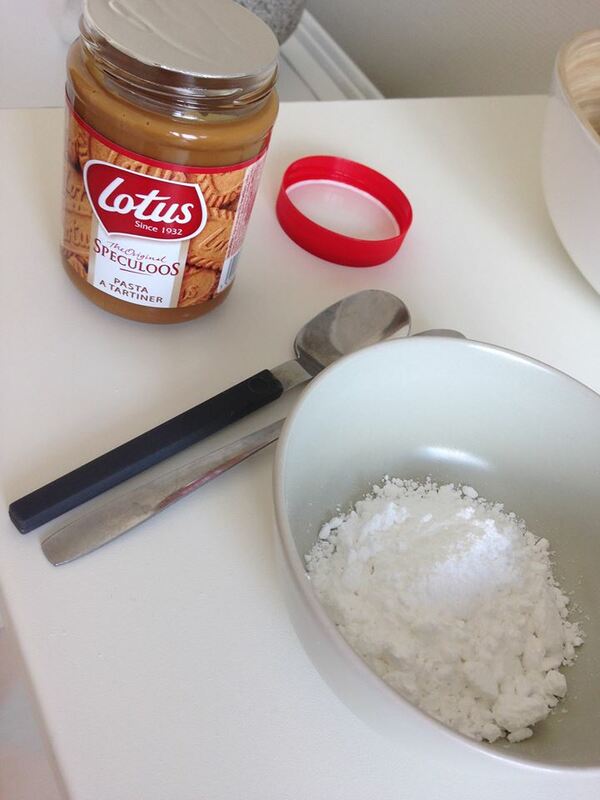 6)Pour the brownie batter into the tin and disperse the lotus spread spheres evenly throughout. Bake in the middle of the oven for 45 minutes. 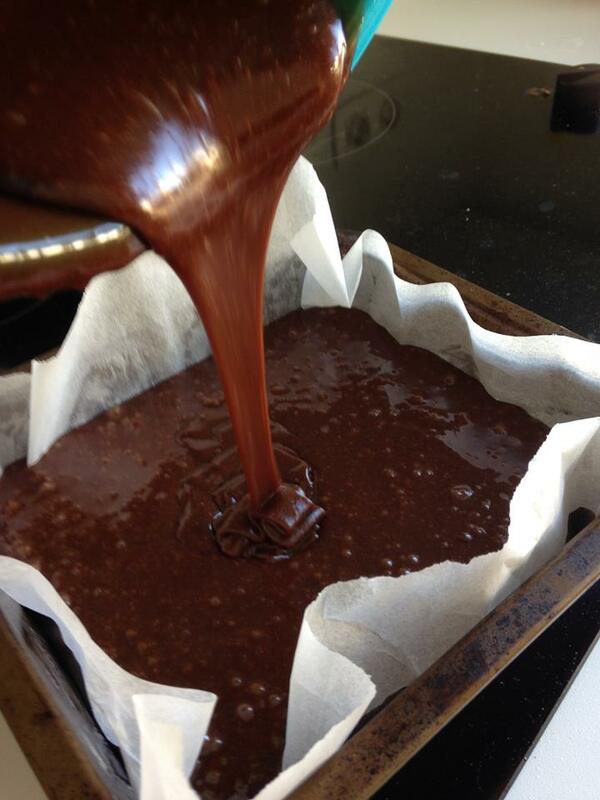 You may need to place tin foil over the top of the brownie at the 30-minute mark to prevent the top from burning. When a knife or cocktail stick comes out clean, your brownies are baked. Fill a roasting tin, or something similar, halfway with really COLD water. Once baked, immediately place your brownie tin into the cold water and allow to sit in this until completely cold (obviously don't let any water actually touch the brownies). Cut into squares. 7) To decorate, melt the white chocolate with the 2 tablespoons of Lotus Biscoff spread in a heatproof bowl set over a pan of simmering water. Stir occasionally. Once melted take off the heat and allow to cool for 5-10 minutes before pouring into a disposable piping bag. Snip a narrow end off of the bag and pipe drizzly lines over your brownie squares. Alternatively, just use a teaspoon for this. Sprinkle with the biscuit pieces, another sprinkle of salt and allow to set. *enjoy warm with vanilla ice-cream. *an electric hand-mixer can be useful to whisk the eggs in step 3. *a microwave can be used to melt the chocolate and butter/Lotus spread in steps 2 and 7, however, DO NOT leave the microwave alone and check and stir the chocolate at least every 10 seconds if you do go for this method of melting. So it’s a rainy day in Brussels (honestly the weather here is more confused than in London and that’s saying something). It's literally rained 4 times today and the sun has come out 5 times. I know what you're thinking- trust the Brit to make a point about the weather in a blog. I'm telling you though, us Brits are onto something because the weather here really is a good talking point! So in this confused weather day I decided to have tea, biscuits and update my baking blog. It's a very British past-time I'll admit. 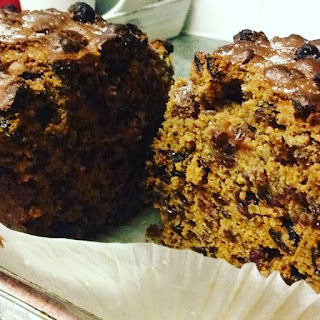 When I moved to Brussels a month ago (albeit temporarily), I came with the fierce attitude that no matter the limits in my baking equipment, I would still manage to bake. I came true on this though I'm not going to lie- it’s been more EFFORT than usual. So far I've made cookies, cupcakes and rocky road, not bad going…So now for the next step- to crack out the laptop and actually write something down! Now this week this bake has caused some confusion- it seems a lot of people don't actually know what rocky road is!! Well let me educate you about this gorgeously chocolatey sugary goodness bite of heaven. 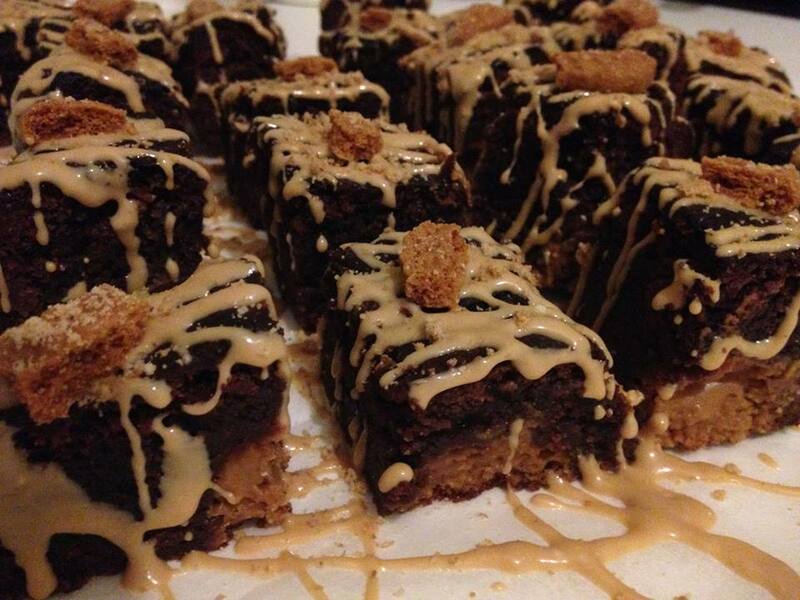 It's just chocolate, butter, syrup, biscuits and all things sweet meted down and mixed up and cut into bite-sized squares. It originates from America but when the British adopted it, they rather appropriately gave it the posh name of a 'Tiffin'. Call it what you want guys, as long as you enjoy it that's all that counts ;). For all those baking-shy people this is the best thing for beginners- there's no oven involved so you CANNOT FAIL. Give it a go. You'll love it. 1) Line a square tin (or anything you have) with cling film, using a dash of butter to make it stick. Set aside. 2) Bring a pan of water to the boil and turn down the heat to a simmer. Chop the chocolate into small pieces and dice the butter into cubes. 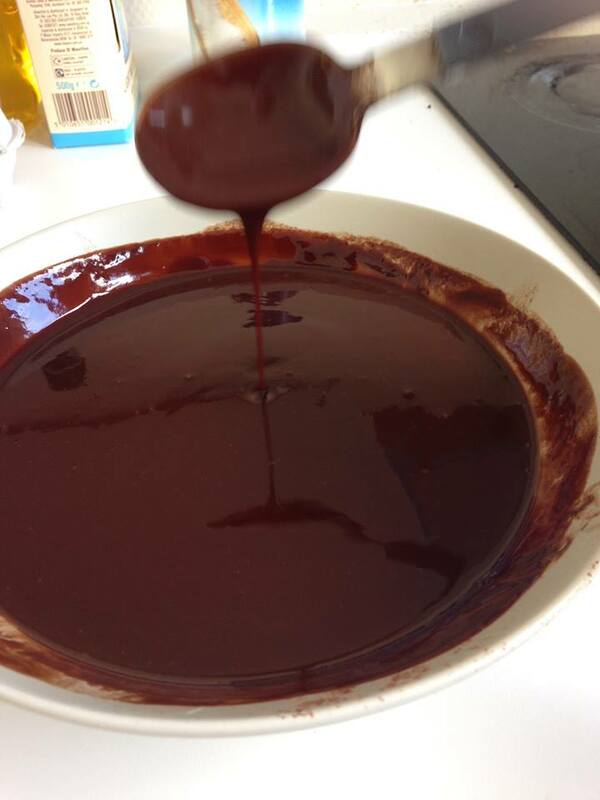 Place chocolate and butter into a heatproof bowl with the syrup. 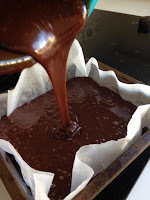 Place over the pan of simmering water, making sure the surface of the water DOES NOT TOUCH the bottom of the bowl (the chocolate will burn otherwise). Allow the ingredients to melt, stirring only occasionally. Once melted take the bowl off the heat and set aside to cool down slightly. 3) Meanwhile break or crush up your biscuits in a big(ish) mixing bowl. It’s up to you how far you go with this; if you like chunks of biscuit then only break them up but if you prefer them to blend in more with the chocolate mix, go wild with a rolling pin/ mallet/ brick (just joking about this one). 4) Pour the chocolate into the biscuits and mix to combine. Next chop up the marshmallows and any other ingredients you so desire, and stir into the mixture. 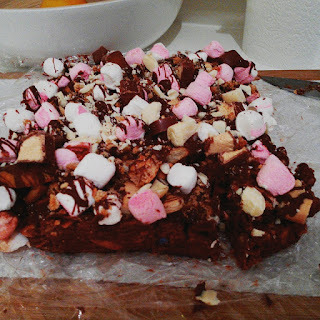 5) Pour the rocky road mixture into the tin and flatten down with a spatula. Allow to cool properly for an hour or so before putting in the fridge to set for 2-3 hours minimum. Once properly set, run a large sharp knife under hot water (yeah you don't want to mess with this girl! ), wipe and cut the rocky road into your desired portions. This will keep for a week or so in the fridge. 6) Dish out to friends and colleagues to fatten them up (optional). 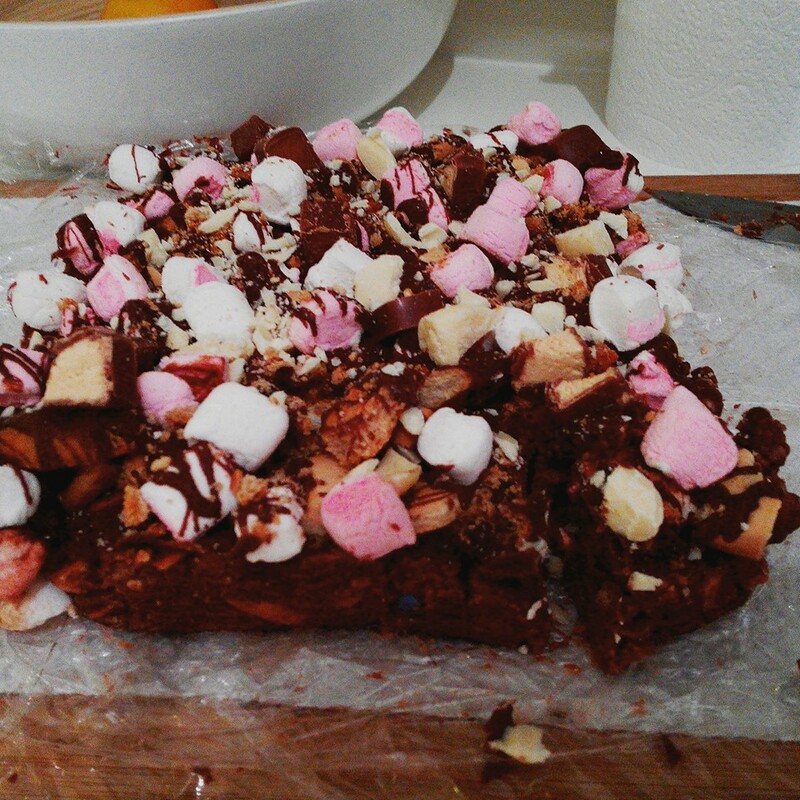 *Going the extra mile: if you fancy being a bit..well…fancy…why not decorate the top of your rocky road? 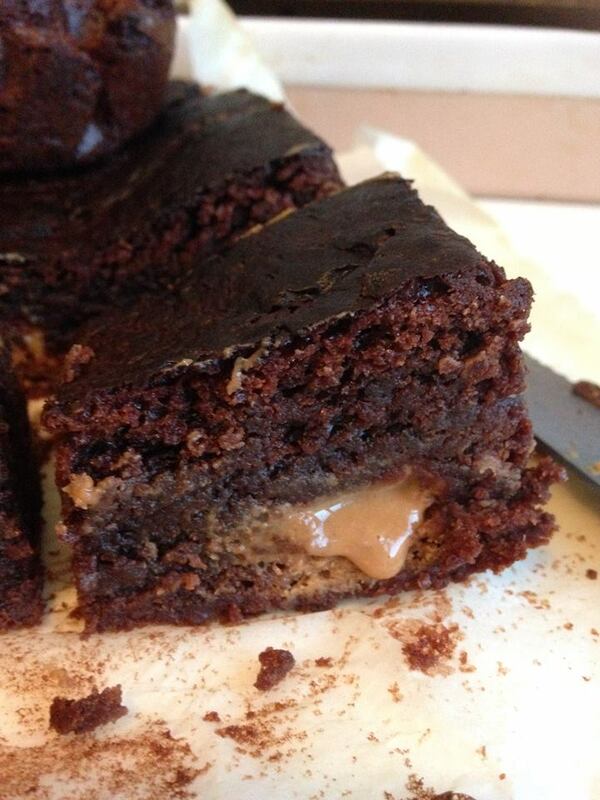 As Mary Berry says, it’s always better to show a bit of what’s on the inside on the outside! I was using this bake as an excuse to use up some leftover chocolate so I went mental with the decoration. A good technique to use is the following: after flattening the surface of the rocky road in step (5) melt down about 100g chocolate and drizzle about half of it over the surface of the rocky road. This will act like a glue to attach your toppings. Add whatever toppings you want, such as chocolate buttons, bits of broken biscuit, extra marshmallows etc. Then drizzle the other half of the melted chocolate over the top in as artistic a fashion as you can manage. I find using a contrasting chocolate to the one you used in the actual rocky road looks nice here (ie milk on white, white on dark). Trust me, the contrast looks very fetching to the eye ;)…as if a cake of chocolate and sheer sugar isn’t fetching enough to the eye! *FANCY FINISH: Once you’ve cut up your rocky road, dust with icing sugar to give it a finished Starbucksy kind of finish. To start off the New Year I thought I’d go for a classic bake – the Victoria Sponge. I made this for my Nan’s birthday a few days ago on request. After all of the indulgent flavours of the Christmas season it was nice to go back to basics with a nice fluffy sponge sandwiched with fruity jam and a light butter cream. This cake really is perfect for those January babies who don’t want a birthday cake too heavy. Or you can use it as a base for an iced extravaganza. Your choice. Rather than creaming the butter and sugar first before adding the flour and eggs, this time I went for the all-in-one method which I previously criticized. Turns out it doesn’t really matter how you mix a sponge. The trick is not to over-mix it! I have also opted for the longer-lasting butter cream filling as opposed to fresh cream. 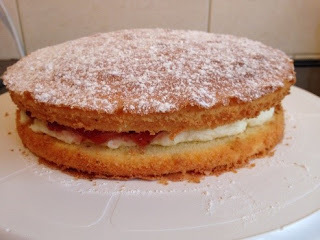 But if you know the Vicky sponge won't last more than 2 days crack out the whipping cream! 1) Grease and line two sandwich cake tins and preheat the oven to 180°C / Gas mark 5. 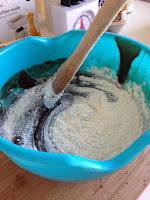 2) Put all cake ingredients in a mixing bowl and mix with an electric mixer or hand beater for approximately 2 minutes until everything is incorporated and a smooth light batter is achieved (I'm talking drop-off-the-spoon consistency...). Divide between the sandwich tins and bake for 20-25 minutes until slightly shrunken away from the sides and springy to the touch. Turn out onto a wire rack and allow to cool. 3) With an electric hand beater fluff up the butter. 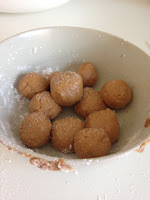 Add the vanilla extract and gradually sieve in the icing sugar, mixing after each addition. It may be necessary to add a dash of milk every now and then to loosen it up a bit. Once all the icing sugar is added continue to beat the icing until pale and spreadable- a couple of minute should do. 4) Spread the jam generously on one of the upturned cakes. Spread the other cake with the butter cream and sandwich them together – whether you have the jam or butter cream on top is entirely up to you! Dust liberally with icing sugar. Gorgeous.